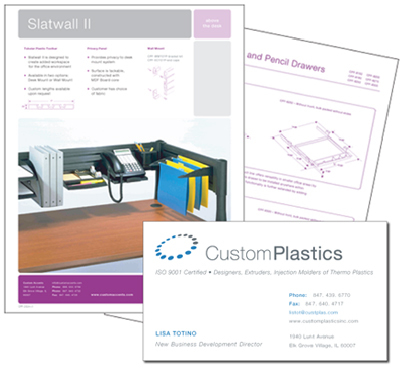 Custom Plastics Case Study - Print collateral material, catalogs, brochures, product branding, trade show graphics. To differentiate a commodity service into a premium service that is perceived to be worth the slightly additional cost. 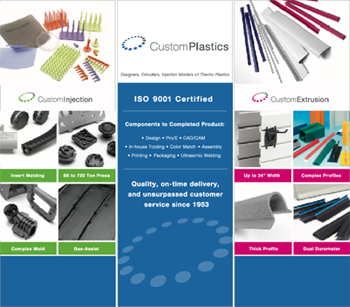 This first challenge is to promote Custom Plastics’ services as a trustworthy, high-quality brand that is able to provide a one-stop solution for all extrusion and injection molding needs. This involves a re-branding of the company. For this, we create an entire identity system that ties the corporate logo with the different “divisions”. The logos are simple, stylish and extensible to other future services that Custom Plastics may provide later. The perception we want to provide is that the company not only can deliver the service as promised, but do with a sense of style and elegance. This is very unique from the ubiquitous clunky, industrial feel that other companies have. We used the identities to develop the entire company’s collateral including their business cards, letterheads, quotation forms, sales materials, sales brochures, sales folders and tradeshow booths. Tags: marketing collateral design, brochure development, tradeshow graphics design. This identity system is used as part of the Custom Plastics website. 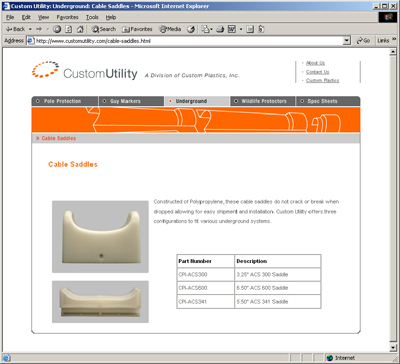 The Custom Plastics website is converted to a gateway / portal to the other divisions and services of the company. Note the consistent use of color as differentiation of the services, but yet retain the overall brand personality of the company. The new branding drives the differentiation of the company from its competitors. Part of our effort to assist Custom Plastics with their sales, we also provide search engine marketing (SEM) services for Custom Plastics to ensure that their website could be found on major search engines. Unlike most other marketing agencies, our strong technology background enables us to provide solid quantifiable results. Evolution Point has developed a formalized 6 step process in executing search engine optimization. This process has proven to be very successful. We have done search engine optimization on multi-languages including English, Spanish, French, and German. 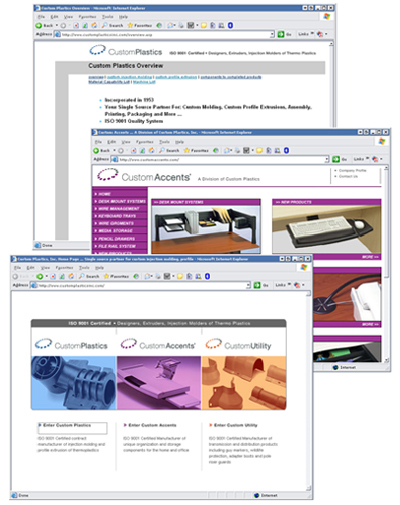 Custom Plastics participants in 4-6 different trade shows annually. Depending on the trade show, the booth space differed in size. As a result, Evo designed several pull-down banners which brands the different divisions uniquely depending on the trade audience. This tradeshow booth is designed to stand out from the rest of the booths. We design a simple, clean and effective layout for quick ingestion of information as people walk by. The design is a composite of 3 different panels which can be used separately or as a cohesive unit, depending on the floor area of the booth.